In 2005, Metro Parks, the City of Tacoma Landmarks Preservation Commission and the community agreed on a long-term plan to secure Wright Park’s status as one of the Puget Sound region’s signature parks. After more than a century of use, the Victorian-style structure needs system and structural upgrades and additional space for botanical displays and interpretation. The Conservatory remains open during construction of the restrooms. Click the left/right arrows to scroll through the slides. 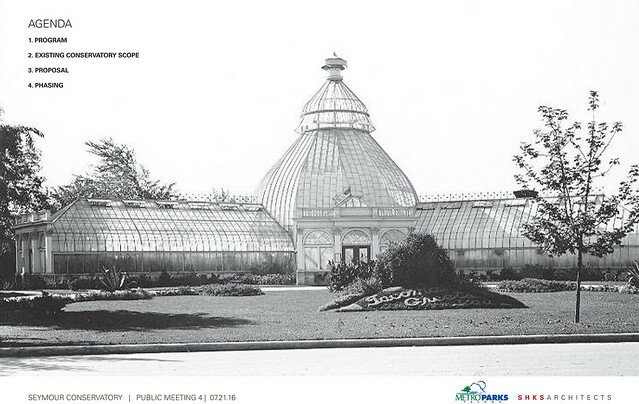 In late 2015, Metro Parks unveiled initial schematic design options to restore and expand the conservatory. The public process included about 300 surveys and numerous comments during public meetings and presentations. After extensive community input, final schematic drawings were unveiled July 21, 2016. Metro Parks has funding for rehabilitation, although further funding will have to be identified for the full designs to be completed. See the possible phasing in the drawings below. Project includes renovation and expansion of the conservatory.